Jonah is a tad over 2 years and 3 months and he FINALLY developed his ability to walk on water. We were starting to get a tad worried that it was taking so long to manifest. But no worries, JBM came through and started walking on water today. Whew! At the risk of offending some religious people, we won't speculate on when he'll be chasing the money changers from the temple. Being the only blond in the house, JBM is a little "lacking" in the eyebrow department. But no more! Not our son. Now he sports nice dark eyebrows! Thick manly mascara eyebrows! Only problem is that he now has a black nose and whiskers. But we like how he looks kind of surprised all the time. Happy birthday to John and Eve! Thanks for the face-painting. 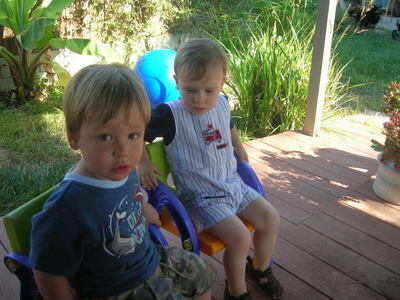 Jonah and Spencer got to “borrow” Cedar’s backyard while she was visiting her grandmother in Michigan. Needless to say they, took advantage of it by sitting in her chairs and eating all her porridge. Good thing Memere was there to keep them from getting really out of hand. After that they stole her car and took it for a joyride. Oh wait, that doesn’t happen for another 15 or so years. But really, don’t these lads look like they are old enough to drive? GAH! Could you, esteemed reader, resist this face? Could you? Well, I bet you could if it was screaming, “Daddy, are you waking up?” for about 15 minutes at 6AM. This coming after you went to bed at around 12:30AM. Now, could you resist? Yeah, neither could I. Darn kids and their early rising cuteness. Here's a photo of wee JBM at the Fire Station in Culver City. Right after this picture was taken, he sliced his finger on a fire truck. Needless to say, if you are going to suffer bodily injury, a fire house is the place to do it. Lots of band aids around. This happened a couple of weeks ago so the trauma has passed thankfully.